Oh, and check out this independent Press Release. Click here to read our Yelp reviews. Please consider leaving a review. Thank you! 2. Read more Yelp reviews here. Click here for our Google + reviews. Please consider leaving a review. Thanks! 2. Read more Google reviews here. 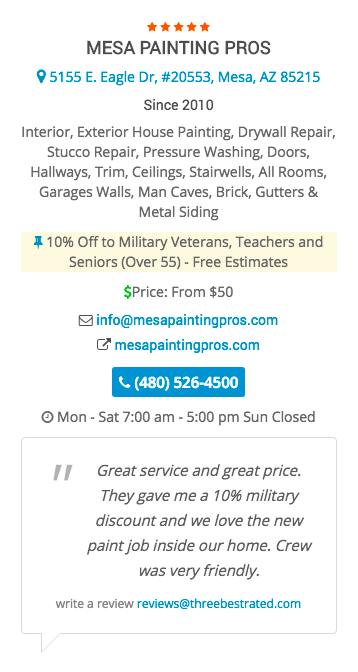 Voted one of the best painters in Mesa! Be sure to Like and Share and check back often for other discounts and special offers! Price Match. We will match any other written estimate you have and guarantee your satisfaction! ​You can't lose with Mesa Painting Pros! Referral Program: When you refer someone to us and we get to paint their house, we will reward you with a $50 gift certificate to say Thank You! Military Discount: 10% always. Always. THANK YOU for serving in our military. If that's you, let us know so we can honor you with a 10% discount for all of our services. Any military ID card, photo, old orders you kept, or anything to verify will do. Teacher Discount: 10% discount. Always. THANK YOU FOR WHAT YOU DO FOR OUR KIDS! Not everybody can do what teachers can do. 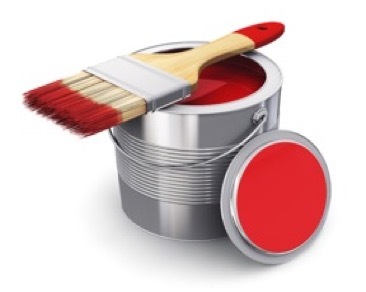 So, we would like to honor you with a 10% discount for all of our painting services. Just fill out the form to let us know. Seniors Discount: 10% discount. Always. For young adults 55 and over, you get 10% off all painting services.